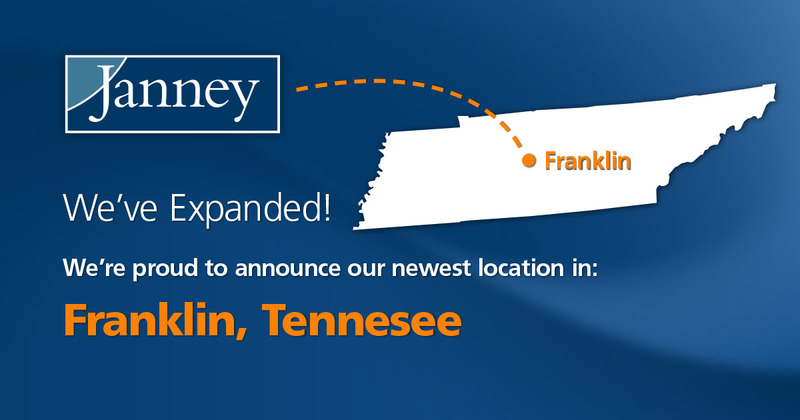 PHILADELPHIA, PA – August 21, 2017 – Janney Montgomery Scott (“Janney”), a leading full-service wealth management, financial services, and investment banking firm, announced the opening of its new Franklin, Tennessee branch office and the addition of five experienced industry professionals with over 90 years of combined career experience. The Franklin, TN branch Financial Advisors are Stephen M. Elder, formerly associated with Hilliard Lyons, and Kim A. Richardson, Jamie M. Smith, and B. Chris Walker, formerly associated with Wells Fargo Advisors. Accompanying the Financial Advisors in the Franklin branch office is Sheala H. Nichols, Branch Operations Manager, also formerly associated with Wells Fargo Advisors. The advisors have more than $330 million in assets under management. “I’m proud that Steve, Kim, Jamie, Chris, and Sheala chose to join us at Janney. Our growth throughout the southeastern region is a testament to our firm’s stability, responsiveness to client needs, and unprecedented home office support,” said Andy Kistler, Senior Vice President, Southeast Regional Manager. Stephen M. Elder, Senior Vice President/ Investments, began his career in the financial services industry with Northwestern Mutual. He is a University of Tennessee graduate and past president of the Middle Tennessee Chapter of Fellowship of Christian Athletes. Kim A. Richardson, Vice President/ Investments, has 18 years’ financial services experience and graduated from Middle Tennessee State University, where he studied finance and economics. Jamie M. Smith, Vice President/ Investments, has over 21 years’ financial services experience and holds the Chartered Retirement Planning Counselor professional designation. He is an Arkansas State University graduate and volunteers with the Second Harvest Food Bank of Middle Tennessee. B. Chris Walker, Senior Vice President/ Wealth Management, has been in the financial services industry since 1991, and has served for five years at Nashville based J.C. Bradford during his career. He is a member of Trout Unlimited and the Coastal Conservation Association, and volunteers with the Boys & Girls Club of Middle Tennessee, Second Harvest Food Bank, and Nashville Children’s Alliance. Janney’s Franklin, TN Office Address is 6640 Carothers Parkway, 8 Corporate Center, Franklin, TN 37067.